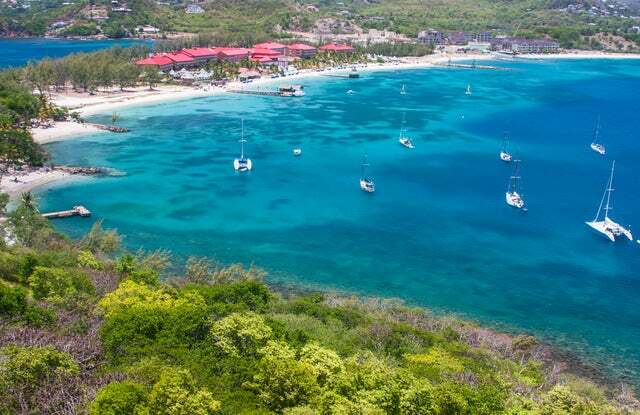 St. James's Club Morgan Bay Resort in Lucia describes itself as 'Simply Beautiful'. Beautiful in the sense that the resort’s staff have a happy disposition and it is surrounded by lush tropical vegetation, white sand beaches and comfy accommodations. The resort's accommodations are divided into rooms and suites. There are 345 accommodation units, of which 100 are hillside rooms and suites. You will enjoy stunning views from the comfort of your rooms which may include; ocean views, pool views, or garden views. The following are the minimum amenities that you can expect to find in all the accommodations at the resort; private bathroom with shower, air conditioning, satellite TV, beach towels, safety deposit box, direct dial telephone, tea and coffee maker, iron and ironing board, hair dryer and complimentary internet access among others. For your dining needs, you can visit the Palms Restaurant for buffet dining with some international flair, Bambou Restaurant for contemporary Caribbean cuisine and Asian fusion, and Morgan's Peir Restaurant for great seafood and wines and the Caribbean Sea views. Other restaurants at the resort include; Le Jardin Restaurant, The Plum Tree Bar & Grill, and Tree Tops Pizza and Pasta. The resort helps the romantics realize their dream of a fantastic wedding and honeymoon. The tropical beach setup is the dream venue of almost all the people that want to hold a wedding. Make a reservation and get help organizing your wedding. Other popular events at the resort include; anniversaries and vow renewals. Popular holiday activities at the resort include; water volleyball, visiting the sap, yoga, golfing, kayaking, snorkeling, motorized watersports, windsurfing, sailing, kayaking, banana boating, catamaran sailing, zip line adventures, sport fishing and many more. Make a reservation today and get to experience a holiday that you could only dream of. You can also view comments about the resort on Trip Advisor here.